« How Indians Can Now Order Equifax Credit Information Report on Demand ? Why You Must Not Subscribe to HDFC Ergo Insurance’s Credit Shield / Fraud Loss Cover ? HDFC Bank’s Credit Card Division is cross selling HDFC Group’s product. 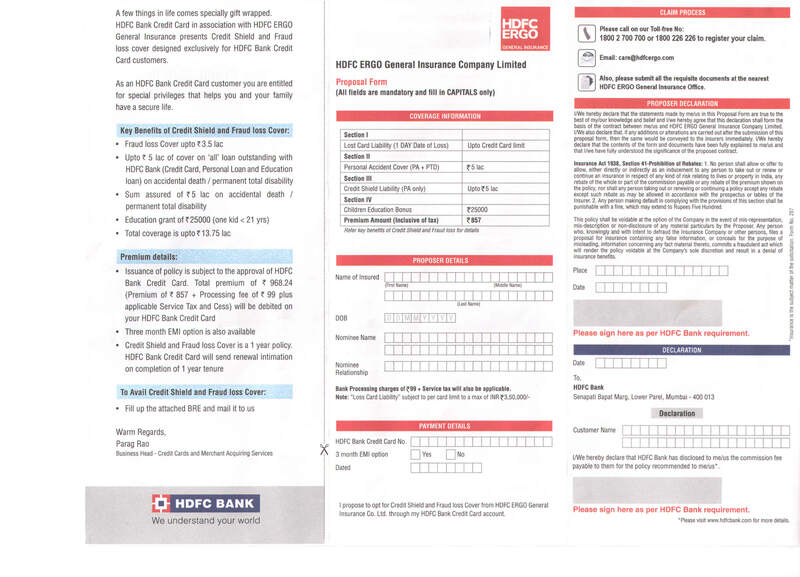 They sent to every customer of HDFC Credit Card an offer for subscription to Credit Shield and Fraud loss Cover from HDFC Ergo General Insurance Co.
What are the Features Offered by Credit Shield and Fraud loss Cover Insurance by HDFC Ergo ? What is the premium they are Charging for the above Policy ? Issuance of policy is subject to the approval of HDFC PROPOSER DETAILS Name of Insured Bank Credit Card. Total premium of Rs 968.24 (Premium of 857 + Processing fee of 99 plus applicable Service Tax and Cess) will be debited on your HDFC Bank Credit Card. Now Why is CardBhai recommending you not to Subscribe to the Above Policy ? CardBhai first called the HDFC Bank Customer Care and asked to Clarify on Section 1 – Lost Card Liability 1 Day Date of Loss – Upto Credit Limit. [See in the Flyer image Above] The executive was totally dumb and she knew nothing about it and asked to write to HDFC Ergo Insurance. 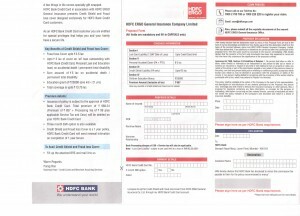 We wish to inform you that, currently this policy is available only for HDFC Bank credit card customers and Policy offers you personal accidental death and permanent disablement,dependent child education amount payable per year maximum no of year payable – 1 year,lost card liability and Credit shield liability. Further, in loss card liability you shall be able to claim for any unauthorised transactions at the time of loss of card till card limit maximum up to 350,000. We wish to inform you that, we shall cover unauthorized transactions that have occurred after the loss being reported to the bank. Read the Last sentence carefully, they are covering only the Loss after the consumer has reported to the Bank. That, in any case is covered by HDFC Bank itself after you have blocked the card by reporting to the Bank / Call Centre. So why Pay Rs 968 to this worthless insurance Offer ? Instead doesn’t it make sense to opt for WalletAssist Program which has ton of Emergency Service benefits ? This entry was posted on Monday, December 24th, 2012 at 1:13 pm	and is filed under HDFC Credit Card. What if I do not subscribe to this insurance? I mean, if I got a card with no annual fees and do not subscribe to this policy then annual fees might apply? I had talk with HDFC bank representative and he said me that it is compulsory to subscribe to this insurance for your card. Please help what to do? I facing same problem as Chintan Patel.